A short article on the fundamental importance of jing shen, and the significance of the spirits on a level beyond the polarity of yin and yang. The style of commentary on quotations from the classics will be familiar to readers of the Monkey Press publications by these authors. In discussing the nature of the psyche in Chinese medicine, the author proposes the translation of shen as ‘mind’ and the complex of the five mental-spiritual aspects as ‘spirit.’ The nature and function of each aspect is discussed in detail, as is their inter-relationship and interaction. As representatives of different acupuncture traditions in the UK, these practitioners are interviewed in depth on their views of the various shen in the theory and practice of Chinese medicine. Examining paranormal phenomena by using the framework offered by TCM, the author presents two cases which he ascribes largely to 'wandering hun.' He discusses his herbal and acupuncture treatment of the patients, and concludes with an appraisal of Chinese, Tibetan and shamanistic ideas related to demonic possession. 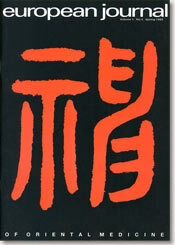 Wang begins by explaining different meanings of the word shen. He looks at the importance of cultivating shen qi, or 'wholeness of concentration', through which the mind becomes peaceful and empty, at one with one's circumstances. He describes some exercises for rooting the shen in dan tian. A short interview with Joseph Needham, the author of Science and Civilisation in China. Discussion of the nature of meridians is followed by the results of the author's research into the coincidence of various linear rashes in conditions such as eczema and psoriasis and the pathways of the channels. Based on the optimistic premise that orthodox medicine is becoming more holistic, the author argues that this is the time to instigate research into acupuncture. After discussing the overall aims of research, he outlines various research methods and the environments in which they can be carried out. He details clinical trials, comparative studies and clinical audits. A clear outline of the legal status of acupuncture in key EC countries, compared with the system in the UK and Eire. The author concludes with a look at the potential for acupuncturists to practise anywhere within the EC in the future, and gives some thoughts on criteria for future legislation.